If you've been looking for a do-it-all body and aren't fearful of a DSLR scale, then as a stills camera there's plenty on offer in the FZ2000. If video is more your thing then we think the FZ2000's sheer capability paints a red cross on the door of the enthusiast camcorder market. When we first saw the Panasonic FZ2000 back in September 2016, we thought it spelled the death of the camcorder as we know it. For this premium superzoom camera is so packed-out with 4K video features that, on paper, it wraps up all the wide-to-tele zoom goodness that you could want in the one body. We loved the FZ1000 predecessor when that was brought to market back in 2014, but the Lumix FZ2000 is a whole different beast. With a new design, internally focusing lens, and advances in performance, is this the 1-inch sensor premium superzoom camera to plump for? Here's what we had to make of the £1100, DSLR-sized Lumix FZ2000 after a week with it in tow. Panasonic Lumix FZ2000 review: What's new? Often updated cameras will tweak the sensor or add a new feature here and there, but the FZ2000 is a total rework over the original FZ1000. The FZ2000's new lens, for example, provides a 20x optical zoom, ranging from a wide-angle 24mm through to a 480mm equivalent. That's a notable amount of extra zoom over the FZ1000's 400mm equivalent maximum, ensuring the FZ2000 keeps the "super" in "superzoom". Plus it can focus just 3cms from the lens front glass at its widest-angle, which is rather impressive. But, crucially, the FZ2000's lens has internal focusing - so once the camera is switched on and the lens has extended into position it doesn't physically move, no matter how much you adjust the zoom toggle. So 24mm sees the lens remain at the same physical length as it does at 480mm. A new feature for many of Panasonic's cameras is a 5-axis image stabilisation system, which counters for pitch, yaw and roll. The FZ2000 takes benefit of this system, too, with that 20-megapixel sensor strapped into the cockpit to make the most of it (excluding during 4K capture). It works well, especially for extra support at those longer focal lengths when the aperture is limited by default. That lens does make a little noise when zooming, though, which might be a nuisance for video capture - but, and having tried the FZ1000 side-by-side, it's not louder, per se, just tonally different in its motor sounds. A long focal length is one thing, but if there's not a great deal of aperture control then it limits the practicality. There are a couple interesting elements about the FZ2000's lens: first, its f/2.8-4.5 aperture tends to mean that ample light can enter the camera (it's not quite as special as the FZ200's constant f/2.8 aperture, though, but that camera has a smaller sensor); plus with nine aperture blades and an actuator for their control it means more rounded bokeh and no "stepping" for iris control during video capture. However, the camera does rapidly arrive at f/4.0 by the time you've extended to an 80mm equivalent, then down to f/4.5 by the 250mm equivalent - so that f/2.8 maximum does fall off rather quickly beyond its 24mm wide-angle position. To compensate you'll more than likely just have to up the ISO sensitivity - it's capped to ISO 1600 in Auto ISO by default, but we've found we wanted to reach for ISO 3200/6400 for a number of situations, given the aperture value at full extension. Because of its fairly large sensor size and paired lens, the FZ2000 is a pretty big camera. We're talking DSLR-sized, really, so perhaps not your casual carry-around. At almost 1kg in weight, it might sound heavy - but we've found it really well balanced in the hand once switched on with the lens protruding. A pro DSLR weighs a lot more. All that doesn't affect the FZ2000's enthusiast target audience, though, and is an unavoidable condition in order to get the necessary coverage of such a sensor. In terms of handling, the large grip to the right is comfortable, while the twin lens rings can be used to push through the zoom range and manually focus if you want. The zoom toggle around the shutter is also used to action the zoom, which actually sees the top thumbwheel - used for, say, aperture control - to be positioned a little too far back win our view. Not that it's out of reach, it just doesn't feel naturally placed. Other big-deal features in the FZ2000 include its built-in optical viewfinder, which is the best we've yet seen in a superzoom, and a 3-inch vari-angle touchscreen LCD. First to the viewfinder: its 0.74x equivalent magnification means it's huge to the eye, the kind of level top-end interchangeable lens cameras offer, while its OLED panel and 2,360k-dot resolution ensure best quality. In low-light the finder does exhibit some lag, though, which can make panning stutter a little - it's just a bit harder to stomach, but fairly normal. There's no faster refresh rate option for this panel, whereas the rear screen offers 30fps or 60fps to help in such situations. The LCD screen might be a more standard offering for cameras these days - it's TFT LCD, not AMOLED - but the ability to move it around as you please via its vari-angle bracket is useful. Saying that, because it's a touchscreen we've very often ended up misplacing the focus point when putting the screen back into its standard position - which is annoying. Still, would rather a touchscreen than not. There's little to nothing absent from this premium superzoom in terms of specification. Press-to-focus on the screen, make adjustments via the camera's rear controls, select between a huge array of focus types - including Pinpoint cross-hair type and 1-Area adjustment - and toggle the dedicated single/continuous/manual focus switch. It's all here at your fingertips. Perhaps the most notable of all these is the autofocus. 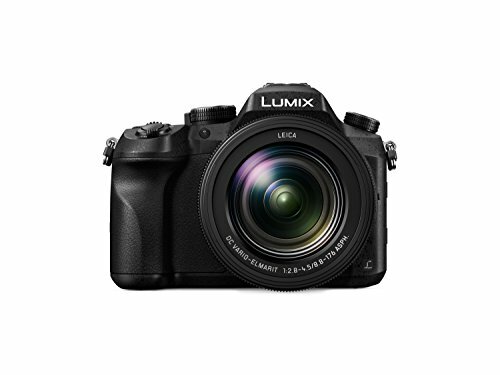 With an arrangement as pulled directly from the Lumix GH4 (which is Panasonic's current top-end interchangeable lens camera until the G5 arrives in 2017) and other Lumix G-series cameras, the specification of this premium superzoom certainly reads well. It generally works well, too, although we've not found it to be as perfect as is in its G-series counterparts. The autofocus modes - face detection, tracking, 49-area auto, custom multi, 1-area, and Pinpoint - are snappy in good light, but need to hunt when the light dims. We took the FZ2000 to the NextEV Nio EP9 supercar launch, for example, and during that presentation the camera was drifting in and out of focus before delivering a generalised “best guess” result. Sometimes it would focus incorrectly. In our use we've found the fail rate to be higher than with the GH4. It's still a decent focus system, but we were hoping it would feel identical to the company's best cameras. Burst mode can whirr through 12 frames per second (12fps) in single autofocus, dipping to 7fps in continuous autofocus when at full resolution. It can be faster still if you flick into what Panasonic calls its 4K Photo mode. This option uses video capture for 8-megapixel images captured at 30fps. It can also be used to shoot a second of footage both before and after pressing the shutter button to avoid missing the moment, or for merging a stack of images after shooting to combine the focus depth. One of the real reasons to consider buying the FZ2000 is its larger-than-average sensor size. The 1-inch scale is the same as found in its Sony RX10 III competitor, albeit it's not the very same sensor. A sensor of this size gives immediate benefit to maximum depth of field, as demonstrated by a shot of a big cat sculpture in a gallery. The blurred background is amplified further thanks to the longer focal length achievable from the camera, something that wouldn't be as pronounced from a smaller sensor model. Just as we found with the Sony RX10, the Panasonic FZ1000 delivers an even stronger set of results than we had anticipated. Having worked between London and New York during this review period we've been confident enough to shoot Pocket-lint product images using this camera: and that's a vote of confidence. Good colour balance, exposure, detail and depth of field all attribute to decent image quality and the close-up macro mode has been particularly useful. The inherent quality of the images is largely free from interfering image noise too. The lowest ISO 125 setting can be extended down to ISO 80/100 if required, but at these settings the dynamic range is slightly less. Shoot at the base level ISO 125 and the results are rich with detail. Further up the ISO scale - take an ISO 6400 shot of a fireplace with lots of dark and shadow areas - and there's some more significant colour noise and a blanket of visible grain. It's not disruptive, though, despite the camera's processing softening the overall appearance compared to the lower ISO settings. In short the FZ2000 is a big step beyond a smaller sensor equivalent, but there are still some JPEG processing artefacts that are a little harsh when it comes to finer detail areas. This becomes more prominent as ISO sensitivity rises, which maxes out at ISO 12,800 (25,600 extended) should you need it. And sometimes, given the f/4.5 aperture at those longer focal lengths, it can see the FZ2000's shot default to higher sensitivities. Overall, and despite the more limited maximum aperture than, say, the FZ200, the FZ2000 is a camera on par with the Sony RX10 III. So if image quality is your primary concern then the main difference between the two cameras will come down to features. The Sony has the longer zoom and wider aperture, but isn't as feature heavy and lacks the same degree of video ability. To this point we've roughly been focusing on the FZ2000 as a stills camera. But as we mentioned in the intro, it's also heavily video-focused, with all kinds of moving image skills. We've already mentioned the internal focusing and smooth iris control, but there are stacks of additional controls that will appeal to videographers. To the side of the lens, for example, are slow zoom-in and zoom-out buttons (Fn1 and Fn2 respectively) for more precise control without wobbly hands being a nuisance. To make the most of the wide aperture there are built-in neutral density (ND) filters, too, as controlled via the switch to the side of the camera. It offers 1/64, 1/16 and 1/4 step-downs, as marked, but there's no way to view this information on screen or in the finder - so you might forget a selection is active. Still, it's a nifty feature for both stills and video. We mentioned the audible motor when zooming, but this can be bypassed by using an external microphone, which the camera offers via 3.5mm jack, in addition to an extra 3.5mm headphone monitoring jack. A mini HDMI out can also be used for ATOMOS devices to monitor externally, including start/stop recording control. Or, if you want 4K 4:2:2 10-bit colour output then the HDMI out can be used to capture via an external recorder (it's 4:2:0 8-bit onto the SD card - of which, there's only one slot in the camera). Leaving barely any stone unturned there's also zebra stripes, time code, synchro scan, luminance level and colour bar control for those higher-end videographers. And if you want V-Log output it's available for an additional £79. And if you're totally lost about what the hell those last two sentences means then, well, rest assured the FZ2000 has all the video ability you need... and then some. In addition to 4K capture in 30/25/24p, Full HD recording is available at up to 120fps in a special slow-mo option. It needs to be activated separately within the menus, which is a bit sloppy, but does exist. As superzoom cameras go, the FZ2000 is without compare when it comes to video capture. The FZ2000 is certainly a big and pricey superzoom, but its premium position is justified for the right kind of user. And with its significant push towards video features, that will be for both photographers and videographers alike. The premium superzoom market doesn't have a huge number of models fighting it out for the number one spot, with only Sony's RX10 III giving this Panasonic a run for its money with its slightly longer zoom and wider aperture. However, the Sony is pricier and we prefer the Panasonic's internally focusing lens proposition. When a normal superzoom won't cut it, the FZ2000's enhanced image quality from its 1-inch sensor is what really stands out. It's a notable jump over the previous FZ1000, while its decent battery life and autofocus performance have actually seen it replace our go-to mirrorless camera for the time we've been using it. If you've been looking for a do-it-all body and aren't fearful of a DSLR scale, then as a stills camera there's plenty on offer in the FZ2000. If video is more your thing then we think the FZ2000's considerable capabilities paint a red cross on the door of the enthusiast camcorder market. The only direct competitor to consider, the Sony has a longer focal length, better build, but a higher price. If it's just stills that you're worried about then buying a DSLR with tele zoom lens might cost more, but could be a great solution - with room to progress for better bodies in the future. The physical size and price could be considerably higher, though.